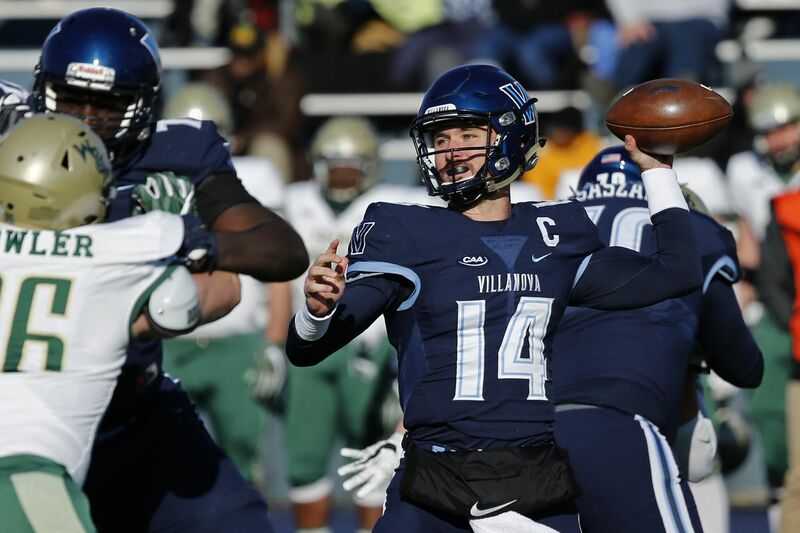 Villanova quarterback Zach Bednarczyk (14) threw for 212 yards with a touchdown and two costly interceptions against William & Mary on Saturday.The Wildcats lost,, 24-17. Villanova football coach Mark Ferrante hadn't yet seen the stat sheet minutes after the Wildcats finished their game against William & Mary. Villanova had more total yards, 368 to 232 — including a 156 to 75 on the ground. The Wildcats ran 78 offensive plays to William & Mary's 49, and amassed 23 first downs to their opponent's 11. "It doesn't matter," Ferrante said. "All that matters is points for and points against and turnovers. We lost in that category. Turnovers were definitely the key." Villanova coach Mark Ferrante reacts to a play against William & Mary in the first quarter. Senior quarterback Zach Bednarczyk returned after missing last week's win over Richmond following an aggravation of his left shoulder injury a week prior. Villanova's first two drives resulted in punts. Then Bednarczyk, on a drive that started on William & Mary's 45-yard line, moved Villanova into the red zone before throwing an interception in the end zone on second-and-goal from the 18. "I made a greedy throw," Bednarczyk said. "I didn't trust my read, and tried to make a throw I shouldn't have tried to make." Bednarczyk, whose shoulder injury kept him out of three games, said he was a little rusty early. He threw a second interception on Villanova's next drive. William & Mary scored a touchdown on the ensuing play less than five minutes into the second quarter. Villanova running back Aaron Forbes looks for running room after taking a handoff from quarterback Zach Bednarczyk during the third quarter. William & Mary then took a 21-7 lead less than four minutes into the second half and then jumped ahead 24-7 three minutes later after a fumble by Villanova's Adeyemi DaSilva. After forcing a three-and-out, a low snap on third-and-4 from near midfield slipped through Bednarczyk's hands and William & Mary recovered. "The ball gets a little slick when it's cold like that," he said. Big Villanova lineman Ethan Greenidge sat out the game because of an injury. "It's just the moving parts that causes the inconsistency," Ferrante said. "Losing two offensive tackles that are a senior and a fifth-year senior, it's probably not going to bode well for us." Villanova now finds itself in a familiar position to end the season, heading into rivalry week with Delaware trying to play spoiler against a team that's going to be in a must-win spot. "It was our Senior Day that week last year so we got our last home game win," Ferrante said. Unfortunately we didn't get our Senior Day win today. But we do have one more game and it's down at their place and I'm sure they'll be pretty amped up to try to win the Battle of the Blue trophy back and bring it down to their place. We're going to try and keep it here and hang onto it."